For today, I have another review for you, but first let me tell you how my weekend was. Usually it's all about house chores, sometimes a movie/dinner date with the hubby and well, a whole lot of cooking. Speaking of cooking, I haven't cooked in two weeks! I miss my cooking. I'm not saying I am a good cook but so far, those who have tried it says I'm good. So I guess, I am good? Hahaha! Anyways, going back to my weekend: I got drunk! Homayghad, I can't remember the last time I got so drunk. Hubby and I went to the building next to ours to celebrate a friend's birthday over lunch. It was just for lunch and hubby and I both thought it'll just be quick. But boy oh boy, we were so wrong. After lunch, the girls were able to talk me into drinking and come late afternoon, I was already intoxicated. We had cans of beer and a bottle of Tequila! It got me all so happy and I think I was laughing my head off the whole time. The hubby let me drink to my heart's content and even took care of me when I started throwing up right after we got home. He made sure I drink a lot of water and cans of sports drink so I don't get dehydrated. He even volunteered to whip up some early breakfast (around 4am) because I think he might have heard my tummy grumbling after throwing up everything I've eaten that day. I woke up before lunch the next day and to my surprise, there was no hangover. So the secret to not getting a hangover is water. But then again, I think I'll hold off on drinking for now. The actual drinking is enjoyable but the aftermath, no fun. Anyway, going back to my review. I know I've reviewed a lot of makeup removers in the past, specifically eye makeup removers, but these has got to be one of my essentials since I wear eye makeup most of the time. Five times a week, to be exact! And most of the stuff I'm wearing are waterproof. I love the good 'ole Ponds cold cream but for the eyes, I need something that will do the job in half the time. I got this at the same time I got my Clarisonic at Sephora in Abu Dhabi Mall. My Happy Skin makeup remover is almost finished and so I figured it's time to try a new one. I got this for AED37 and me thinks it's priced just fine. 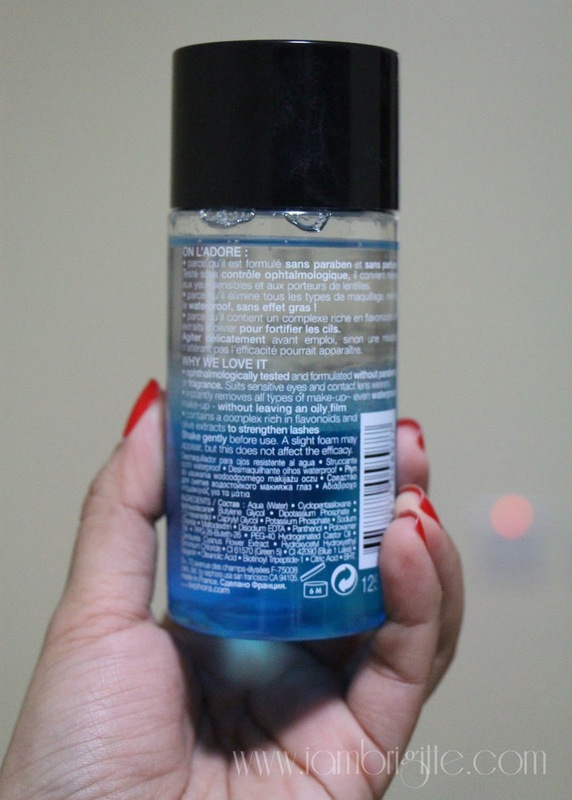 It is a waterproof eye makeup remover suitable for contact lens wearers and those with sensitive eyes. 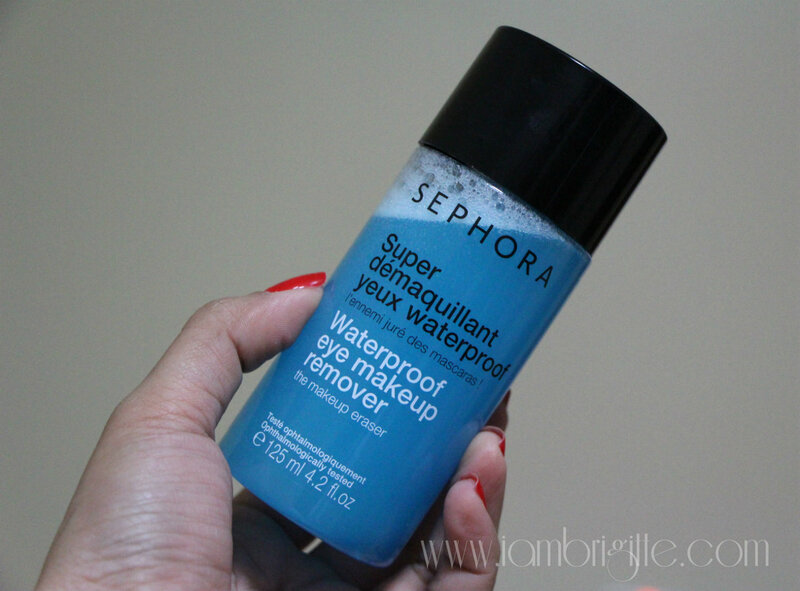 To put it simply, this is not just a makeup remover, but also a skincare product as well. Packaged in a transparent plastic bottle (which is so Brigitte-friendly, LOL!) is a bi-phased liquid that needs a bit of good shaking before you use it. It also has the ingredients listed at the back of the bottle and also an indicator that this product expires 6 months after opening. Too soon? I don't think it would be a problem for me though since I'd be using this baby everyday. It comes with an opening that dispenses just the right amount of product. Then put the cotton pad on the eye area for a minute or less (to loosen the makeup) then gently slide the cotton down to remove makeup. Usually, I do this twice for each eye then gently wipe off what's left. But I swear, it really does take my eye makeup off, as in totally! 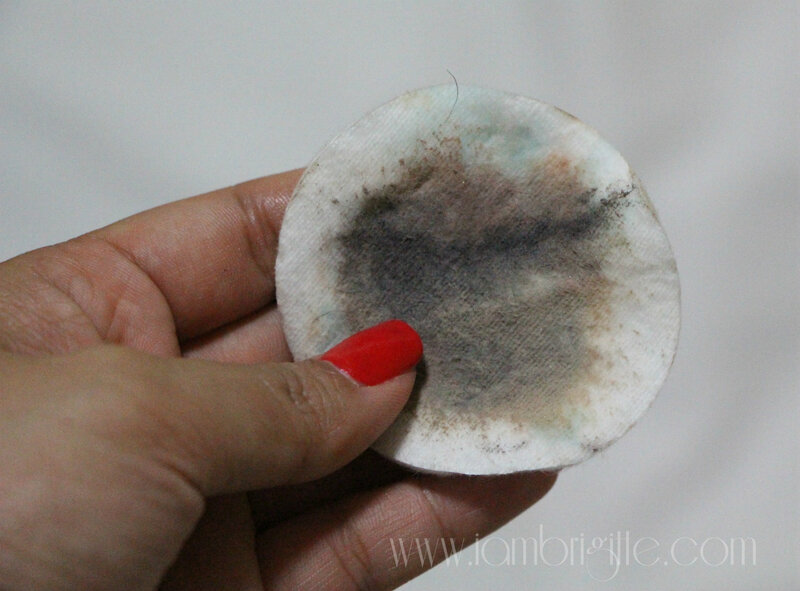 This is usually how much eye makeup I wear daily. 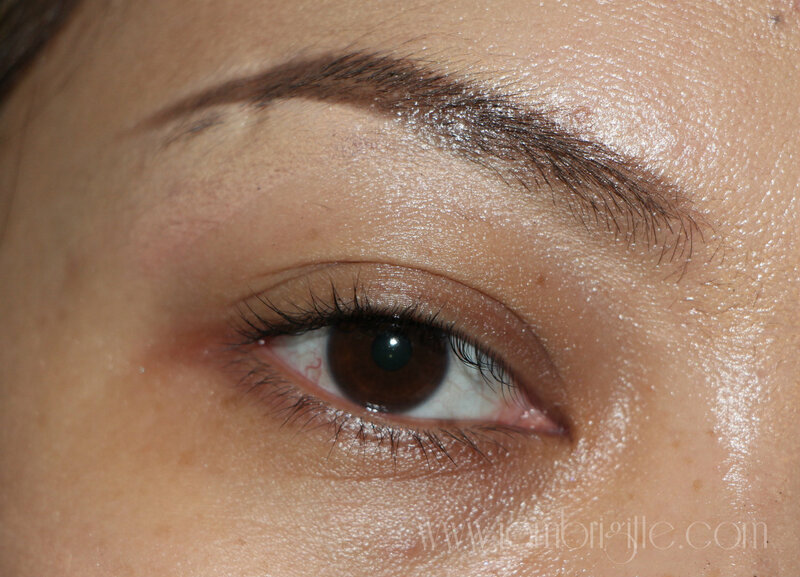 Even the concealer + powder on the under eye area is gone! And it does take off a lash or two, too! Wahahaha, just kidding. 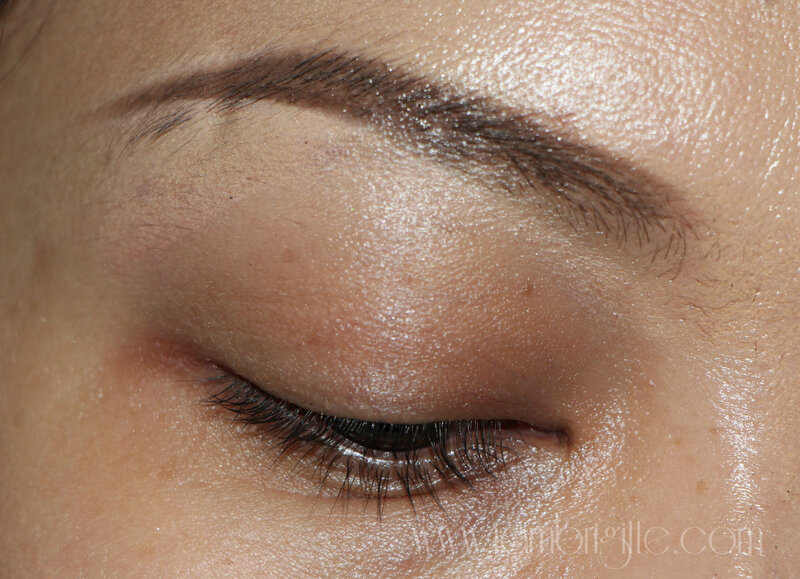 A lash fell off but certainly not because of the makeup remover. I guess I need to use more of this so my lashes will be a lot stronger! I was surprised to know that this baby didn't work on some people. When I posted a photo of this on my Instagram, two commented that it didn't work for them. 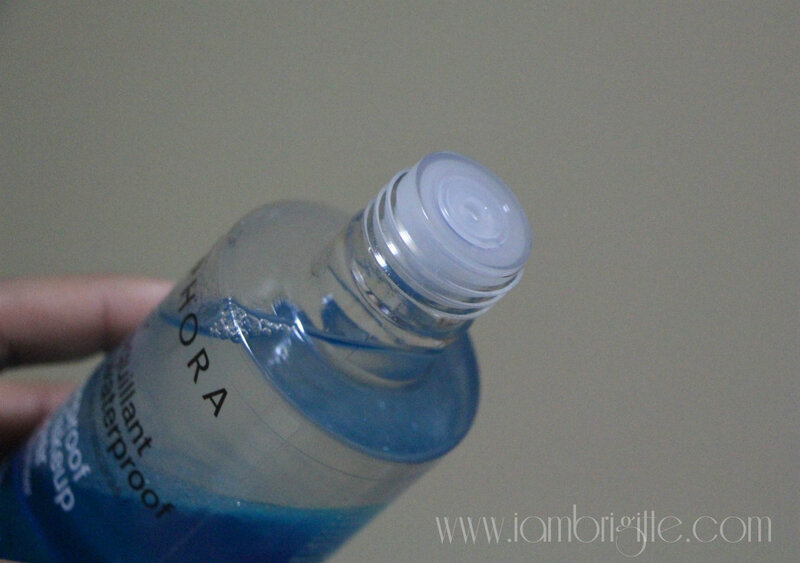 Honestly, this is one of the best makeup removers that I tried. It gets the job done…fast and easy! It doesn't sting and doesn't give me allergic reactions. It doesn't leave me with a blurry vision. You don't need a lot of product. No need to get a cotton pad soaking wet so this bottle will last I think for 3 months or more even if you use it everyday. The bottle is made of plastic. It's light and I don't have to worry about breakage just in case I drop it. Yes. 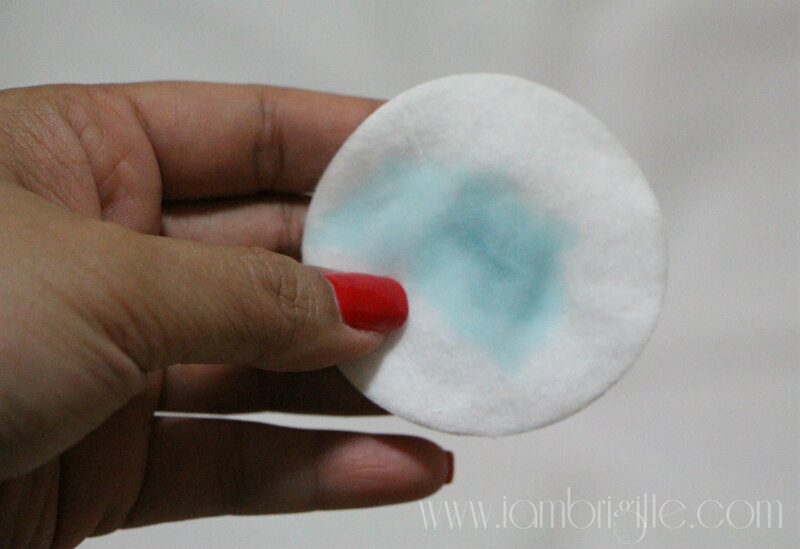 But I will not stop trying out other eye makeup removers! For my face, I still use Ponds cold cream then remove everything off with wet wipes. I love when I massage my face prior to washing my face. 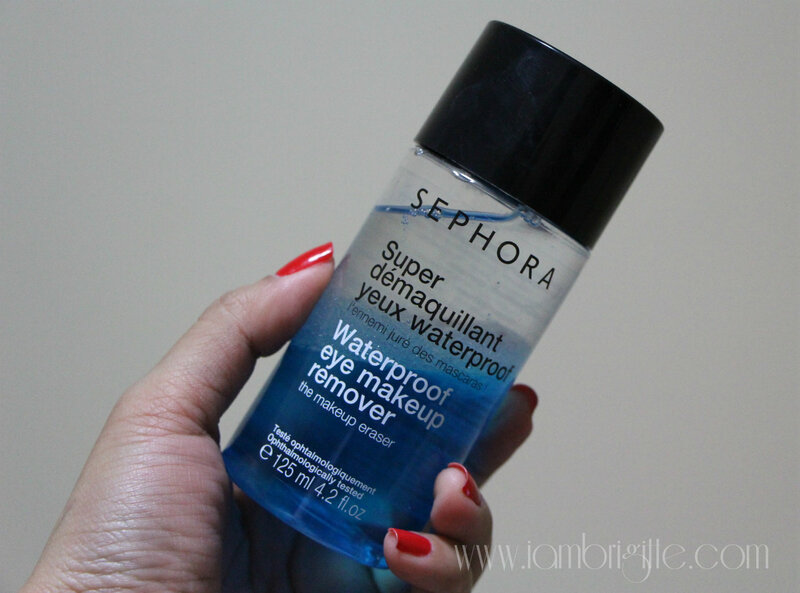 How about you, what's you current favourite makeup remover? 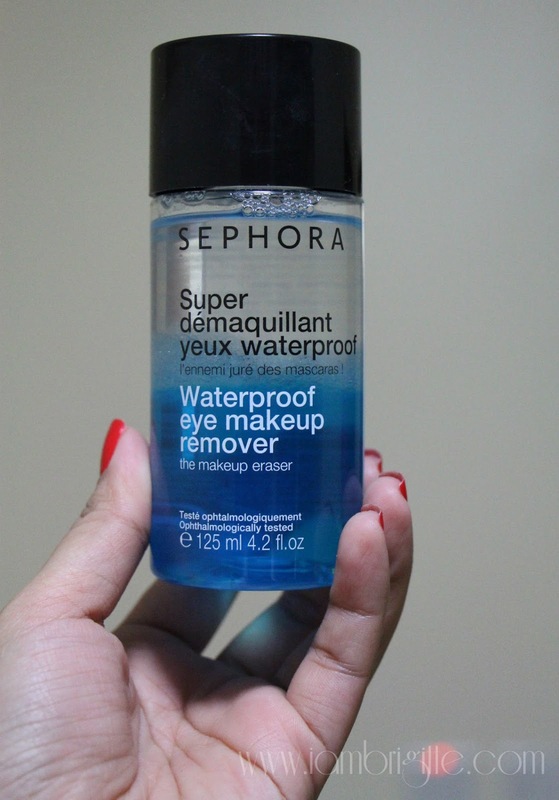 I love this makeup remover :) The most reliable choice for waterproof or whatever super durable eye makeup I have on. Minimal effort pa!